Long time readers probably think I'm reviewing this one entirely because it's my favorite animal, but there are plenty of other SCP's featuring Diptera - including one I wrote myself - and sometimes, we're all the more discriminating towards things we're already accustomed to liking. A lot of insect SCP's kind of blur together in my head, to be honest; the same old mundane "ew, bugs are creepy" horror we've seen countless times before, and 3063 isn't even really an exception to this. 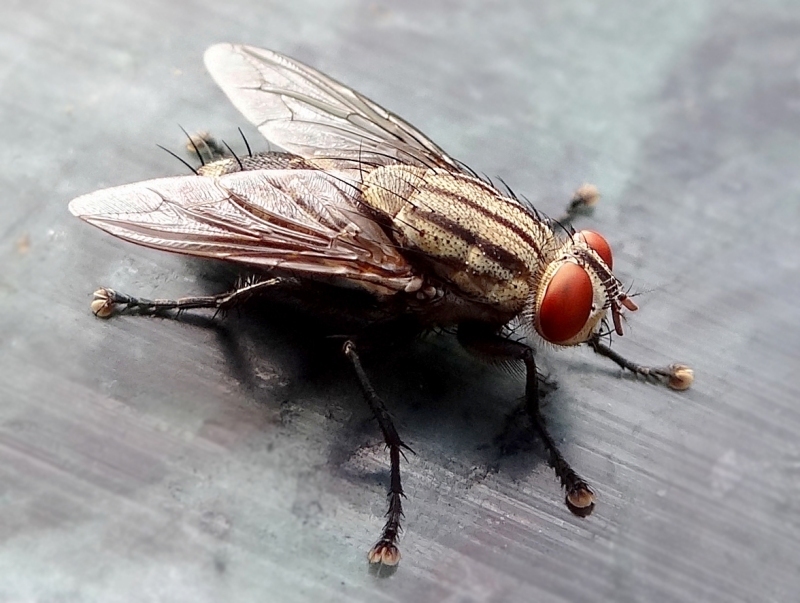 The SCP itself isn't necessarily the fly, but something of seemingly immeasurable power that speaks telepathically to humans through the body of an ordinary, common housefly, and can manifest in another fly wherever and whenever it pleases. This means that the foundation is aware of the entity, but has yet to find any means of actually containing it. The entity behaves essentially like a genie or a wish-granting demon, seeking out a seemingly random human and offering them literally anything they want, even if their wish alters reality. If the individual accepts the offer, the fly combusts, the wish is granted, and the sucker(?) has a mere(?) six and a half years left to live. When their time is up, assuming they haven't died by some other means, the victim's every last bodily cavity, every organ with any empty space inside, will fill up completely with the eggs of "every species" of Diptera, and they'll remain alive as the tens of thousands of maggots slowly devour their body. Now, I'm not sure if it's really necessary that these be the eggs of every Diptera. This would have to include species whose larvae evolved to absorb nutrients from within caterpillars, imitate the larvae of ants, filter bacteria from dirty water or drink nectar deep within rare flowers. Flies are wildly specialized creatures, and thousands of them would have to have anomalous modifications in order to feed on human tissues or even feed on solid matter to begin with, which feels just a little excessive to me for whatever reason, even if it'd be pretty cool to stand by and watch someone erupt with insects rarely (or never before) seen by human eyes. Finally, I could meet Mormotomyia hirsuta without visiting the single, tiny Kenyan cave they've ever been found in! Finding parasitic insects as passè as I do, then, there are two details that "sell" this SCP for me. First, the six and a half years is an almost perfect time span to make the offer truly diabolical. The human mind has an almost innate difficulty caring about something that will happen more than a couple years away, until of course the date begins to creep within sight, and what if you were going to die anyway, of cancer or a car accident or murder? What if you wasted your chance to have anything imaginable and were never going to last long enough to get eaten by maggots anyway? Second, there's actually extra text you can highlight that's hidden in every single paragraph break of this SCP, even within the testing log, and it adds some lovely symbolic context to the SCP's choice of form. It may not be giving you too much time by human standards, but to a fly, that 6.5 years is staggeringly generous. Dozens to hundreds of lifetimes in fly-years. It's a perspective you might never have thought to view the situation from, but adds an extra layer of persuasion to the creature's offer. You're getting half a decade of anything you could ever dream of, while other creatures in this world only buzz around and eat poop for a couple of weeks. We even establish that suicide works as long as you do it before the time is up, so you don't even HAVE to get eaten by all the maggots ever! This is a no-lose situation! Are you stupid or something!? What are you doing turning down a once-in-a-lifetime offer of that magnitude!? You'll love it! Trust me!